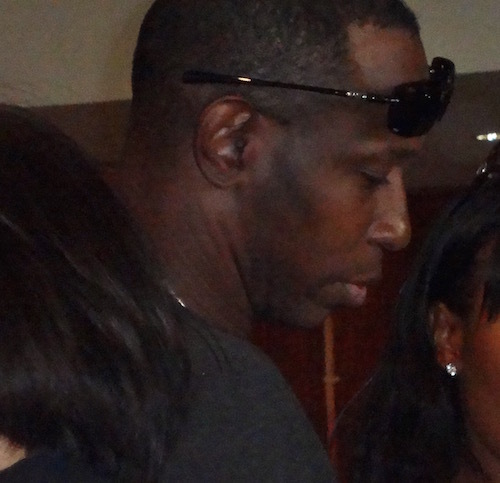 Saturday, former MLB star and current Los Angeles resident Kenny Lofton was spotted in the audience of a book signing event that featured Laker greats Byron Scott and Magic Johnson. The gathering was held at the Equinox Sports Club West LA. This iFolloSports.com original photo provides an up close look at the now 49-year-old ex-ballplayer. Lofton played from 1991-2007 and was one of the most exciting players of his era. The outfielder took the field for several different teams, but is best remembered for his time with the Indians. The Indiana native was a six-time All-Star and four-time Gold-Glove winner. Lofton was also one of the game’s last true base stealers and classic leadoff hitters. The speedy lefty stole 622 bags in his career (15th all-time), including 75 in 1996. He led the American League in SB every season from 1992-1996. A great all-around athlete, Lofton played basketball at Arizona, where he was the starting point guard on a team that included Steve Kerr, Sean Elliott, Tom Tolbert and Jud Buechler. The star-studded Wildcats advanced to the 1988 Final Four in Kansas City, before losing to Oklahoma in the national semifinal. These days, Lofton is the co-owner of Filmpool, a production and post-production company, headquartered in the LA County city of Burbank, California.